very interesant! 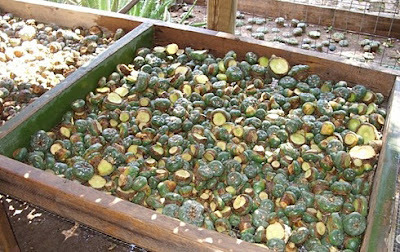 peyotero is a very good job :-) I'm impression from the number of peyote.. more than 1 milion!! The native church eat a lot of cactus! I now look down on the ignorance of the native american church for not using cultivated specimens. Regardless how the plants are harvested. they are being destroyed, and despite how spiritual or close they think they are to the peyote and their gods. The peyote was not born for them to take in that way. In older times when tribes existed and things were more traditional, this is different. Now with capitalism and the devil white man and illegality of the substance they are sooo lucky and barely permitted to use, They should be way more understanding and stop pilfering the last little bit of honestly natural specimens. Those who think they respect the plant so much are those who are desroying it. 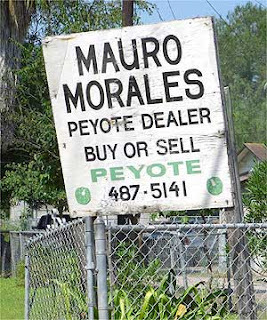 Just look at the picture is says everything "PEYOTE DEALER! buy and sell" things are no longer the way they used to be. GROW YOUR OWN IF YOU INTEND ON CONTINUING YOUR ANCESTORS PRACTICES! otherwise discontinue your ways because they are in no way what your grandfather would do... at any point when a tribe or culture sees they are doing more destruction than worship or good, they stop what they are doing. Sea turtle was a delicacy in hawaii until they realized they have almost killed and taken all the turtle. Now it is illegal to even touch a turtle. they are "hands off" if they hawaiins like in the indians case wanted to continue this tradition they would have farmed turtles, however they didnt. They truly respected the animal and left it alone... Soon you will have eaten all the peyote and you will have no choice but to cultivate if you consider continuing your ways... You might as well stop now and allow some existince of the wild plants so you can at least show them to your children. This is a complex issue that requires consideration to be resolved properly. 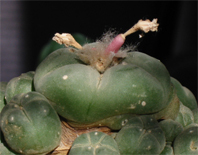 As mentioned above Martin Terry of the Cactus Conservation Institute (CCI) is one of the few scientists currently doing serious research in peyote conservation issues and the Lophophora genus in general. He has conducted studies on proper peyote harvesting techniques along with investigations of how (proper) harvesting affects the regrowth of peyote. Terry has also discussed other proposals for supplying the Native American Church with sufficient amounts of peyote, ranging from increasing the rate of peyote production in situ (by fertilizing natural populations) over greenhouse cultivation (as mentioned in this post) (as an aside, Terry is currently working on a cladistic study of Lophophora based on DNA sampled from several of the known wild populations in Mexico). I encourage everybody seriously interested in the Lophophora genus and those concerned about peyote conservation issues to support the CCI.